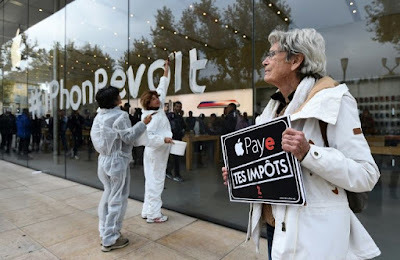 Protesters in France last week carried signs urging Apple to "pay your taxes"
The EU pushed on Tuesday for Europe to draw up a blacklist of tax havens after the "Paradise Papers" revealed loopholes used by Apple and Nike as well as celebrities including Formula One champion Lewis Hamilton. While seeking to minimise taxes is not necessarily illegal, revelations from the 13.4 million leaked documents have already proved embarrassing to figures as diverse as U2 singer Bono and Queen Elizabeth II. Apple is the latest company to become caught up in the leaks, which show how the technology giant moved tens of billions of dollars from low-tax Ireland to Britain's Channel Islands when Dublin began tightening its laws in 2015. But Apple said shifting the funds to the island of Jersey, which is largely exempt from EU tax regulations, did not save it any money. The leaks -- which shed further light on how the global elite manages its money after the Panama Papers and LuxLeaks scandal -- were centre-stage at Tuesday's meeting of EU finance ministers in Brussels. The EU has struggled for more than a year to finalise a list of non-EU tax havens, with smaller, low-tax nations such as Ireland, Malta and Luxembourg reluctant to scare companies away. But EU Economic Affairs Commissioner Pierre Moscovici, who is leading the blacklist effort, said he wanted it in place by the end of the year. "It must be credible and up to the challenge," he said. Sources said EU officials have warned about 60 countries that their tax policies may be at risk of blacklisting, demanding further information before November 18. It is the latest international effort to clamp down on tax avoidance -- increasingly seen as a moral issue -- following a similar move by the OECD group of wealthy nations to compile a list of "uncooperative tax havens". 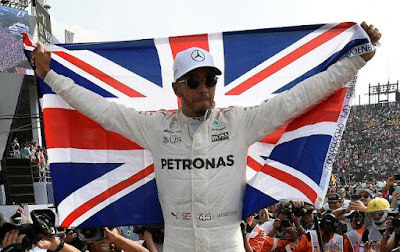 In Britain, the BBC and The Guardian reported that Hamilton avoided paying taxes on his private jet using an elaborate scheme now under investigation by tax authorities. Documents showed that the driver received a £3.3 million ($4.3 million, 3.7 million euros) tax refund in 2013 after his luxury plane was imported into the Isle of Man, a low-tax British dependency. Hamilton's representatives could not be reached by AFP for comment. Another report in French newspaper Le Monde said sportswear giant Nike used a Dutch loophole to reduce its tax rate in Europe to just two percent, compared with a 25 percent average for European companies. Nike, which says it acted legally, managed to save taxes by using an offshore subsidiary, the report said. Separately, the documents showed that US Commerce Secretary Wilbur Ross had a 31 percent stake in shipping firm Navigator Holdings, a partnership with Russian energy giant Sibur. That company is partially owned by Vladimir Putin's son-in-law Kirill Shamalov and by Gennady Timchenko, the Russian president's friend and business partner who is subject to US sanctions. The cabinet member's ties to Russian entities raise questions over potential conflicts of interest, and whether they undermine sanctions on Moscow over the war in Ukraine. Ross has denied any wrongdoing, telling Bloomberg News he had already been planning to sell his stake, while Russian politicians stressed that the deals were legal. Irish singer Bono, meanwhile -- an ardent anti-poverty campaigner -- said he was "distressed" by documents showing he invested in a Lithuanian shopping centre which may have broken tax rules. 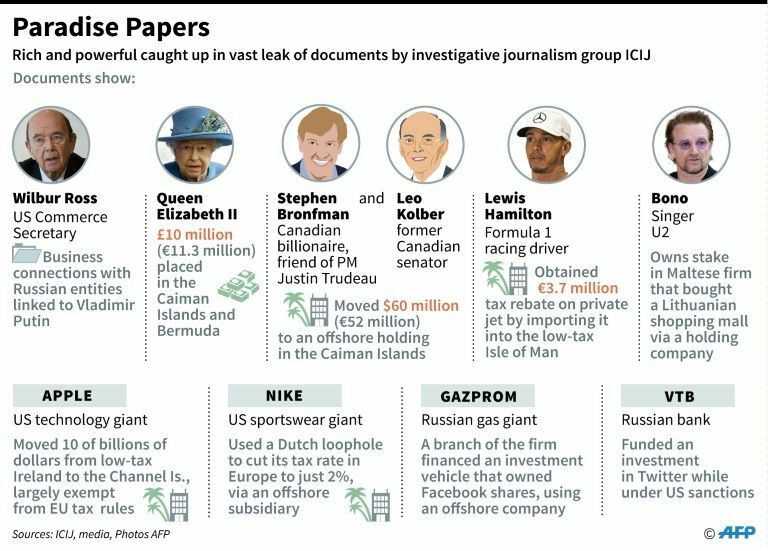 Earlier reports highlighted that about £10 million of the private funds of Britain's Queen Elizabeth II were placed in the Cayman Islands and Bermuda. Her estate emphasised that her investments were "fully audited and legitimate". Europe's anti-trust chief Margrethe Vestager said the leaks served as additional evidence that the business world needed to be more open. "We cannot... rely on leaks or investigative work, we need more transparence," she told a meeting in Lisbon that brought together technology investors and entrepreneurs. "That's why we ask that every company reveal the totality of the information concerning its presence in every country," she added. 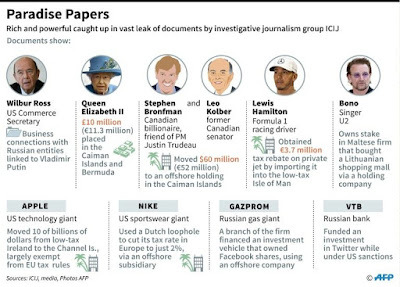 The Paradise Papers documents, which are mainly from the offshore law firm Appleby, have been shared with international media via the US-based International Consortium of Investigative Journalists. Appleby has denounced the release as a "serious criminal act" and stressed that its "overriding objective" is to comply with regulations around the world.